Hello eveyone in all of Neopia! My name is Queen_of_Krawks. A woman should never tell her age, but I assure you I am old enough to know the rules and still young enough to play this great neopets game!!! My mother Happyjenia is the MOST beautiful person I have ever known, perhaps I am being a little one-sided, as she has always given to me everything I wanted as a little girl. When I grew up the task of getting what I want was my idea guided always by my mother's kind heart. My mother gave me my beautiful name and then she painted me to suit my name and that is why I am a Royal girl! I love Neopia and being a Queen has it's great times as well! I travelled to every part of Neopia to visit our lovely people. I love Faerieland as it has a spectacular view, more so than my Grand Castle even! Haunted wood I had to visit in the daytime as I found it to be very scary and I don't like to be scared, however all the people who live there were very very kind to me! I must say that I am not too strong at the test your strength game, I am a lady! Darigan Citadel is another scary place for me too! I did not stay long there, I do love the color purple though!! I loved Roo Island so much fun there and beautiful beaches and great fun people!! I got a funny hat that I have kept! I visited Both Kings in Brightvale and Merridel and I tried to make that poor grumpy King Skaarl smile but he gave me a "C" and chuckled! Terror mountain was very cold, but Mika and Carrasa made me feel at home in there Igloo, so kind ! I was gifted a snowager sculpture from them. I did not see the snowager as he was sleeping! The lost desert for me was so hot and sandy but some beautiful pottery and very kind patrons live there, I did not venture far from the city into the desert as it is known for it's many terrible creatures! I visited Krawk island and played some bilge dice and even had a sip of light Grog that the kind pirate gifted me!Those dubloos are so cool! I absolutely LOVE fishing so I went with a local krawk to the underground fishing hole and we spent several hours sitting on the dock with other people and I even caught a Rotten Left Shoe! I tried to get a matching pair but after some time we decided to go before it got too dark! I still love my Rotten shoe! My last and most intereseting stop was Mystery Island! I so love it there, i got my future read by the local Island Mystic, played Tombola, took a harbour cruise, played some beach volleyball with some very great children (we won!!). I went to the rock pool and played a game of Gadgads!! Then I tanned on the beach for several hours and ate some tropical fruit! Everyone was so friendly, at this point I was there most of the day and since I arrived people followed me everywhere I went especially this little girl who was a tropical Island Alkenore, so beautiful! She followed me everywhere! I fell totally in love with this Island Alkenore that the elders of the Island took notice as I fed her some tropical fruit and cuddled her, that they insisted I keep her for my family! I was not sure about this and wondered about her family but the elders advised me she was a petpet and loved to have a beautiful owner and she would then be named and love by this owner and always loyal and caring too! I was delighted I opened my heart totally and invited this Beautiful Island Alkenore to be with me and I would always love her! She was so very excited and asked me what I would call her, the only name that I could ever think of was Princess! My little baby Princess! I enjoyed this beautiful Island and it's many wonderful people and after the day's end left for my home with my baby Princess!I learned so much from my visit's seeing people work so hard for everything they get that it inspired me to work too! I have completed now 22 jobs and have a tile of Trainee!! I also entered a beauty contest and in my very first one (i was scared so much) I got a second place! Another trophy to add to my rotten shoe and snowager sculpture! 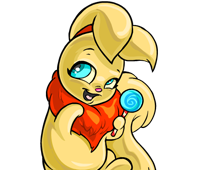 Since I love Princess so much I gifted her a petpetpet and she chose a Veespa as she told me it had the colors I loved so much: Royal Gold and Purple!! We are such a happy family and we love and support each other so much that I am thank-ful to everyone in all of Neopia for showing me there culture and gifting me such trophies and a desire to learn! Now I read so much as I want to know about everything! I have read at least 97 books of all kind and intend to read much more! I have been told that it is wonderful to see me as a person having fun with everyone but most of all it is the best that everyone who has fun with me knows I am a Queen!! Thank-you !